It’s the beginning of the year and most people are busy tackling resolutions about diet and exercise. I should be one of them, but it is going to have to wait. First comes a weekend in New Orleans. This is one of those cities where I could drive myself crazy deciding where to dine. But in fact, I have made up my mind fairly easily. Toups Meatery is up first. Chef/co-owner Isaac Toups is currently appearing on “Top Chef”, Season 13. He’s one of the most entertaining chef’s on the show, his goofy humor enhanced by a charming Cajun accent. We arrive in New Orleans on a Thursday night, just in time for “Top Chef” to hit the airwaves. We are treated to a meta moment of watching Toups watching himself on TV. The Toups Meatery menu is heavy on shellfish and pork (hello, it’s New Orleans and it’s called a “meatery”) so I call in advance to see if they will accommodate my kosher husband. They offer to prepare him a fish dish, which is good because I was ready to ditch him rather than skip a meal at Toups. I go shellfish all the way with Gulf Seafood Couvillion, which incorporates Louisiana Gulf fish, shrimp, and crab fat rice. The Gulf shrimp have a stronger flavor than shrimp from the Atlantic, and they hold their own against the sauce that is rich, aromatic, and spicy. It’s the perfect dish to start off a New Orleans food-fest. 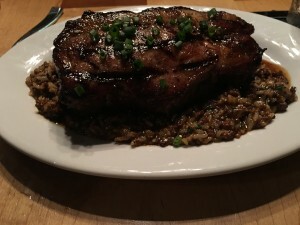 My friend gets piggy with it, digging into a huge double cut pork chop served with dirty rice. Chef Toups is a master of dirty rice, which is being confirmed at this very moment by the “Top Chef” judges. If you’re not a fan of the show it’s perfectly fine. Dine at Toups Meatery to experience quality Cajun cooking with a modern twist. Shaya. One of the hottest new restaurants in New Orleans is Shaya. I hesitate, probably like many people, to allocate one of my three New Orleans dinners to Israeli cuisine. 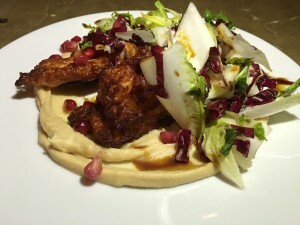 But Chef/owner Alon Shaya’s restaurant should be required dining for food enthusiasts. 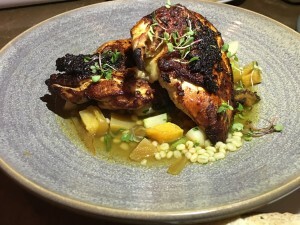 Chef Shaya partners with the well-respected New Orleans chef/restaurateur John Besh on this and two other restaurants in town. Shaya is a winner of a James Beard Award in 2015 for Best Chef: South. And in an Esquire Magazine review by Tom Junod, Shaya is named “The Best New Restaurant in America.” Google it if you are interested in reading about additional accolades. The restaurant is a dream come true for vegetarians and non-shellfish eating pescatarians, who have slim pickings on many other menus in this town. 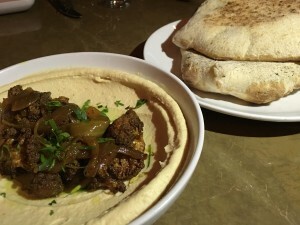 We begin with a hummus selection, tearing off pieces of the warm fluffy pita bread and immersing it in flavorful dips. Curried fried cauliflower with caramelized onions and cilantro is a favorite. The pick three items “For the Table” for $15 is a deal. Lutenitsa – a pureee of roasted pepper, eggplant, garlic and tomatoes is a tasty choice. So is red beets with tahini, dill, and black pepper. It may be just as easy to close your eyes and point, rather than be forced to select from dishes that have such equal appeal. Crispy halloumi is an unexpected pleasure with caramelized celery root, pomegranate, and winter greens playing a role as essential to the dish as the cheese. Our first bite of red snapper chraime is followed by a quartet of wows. 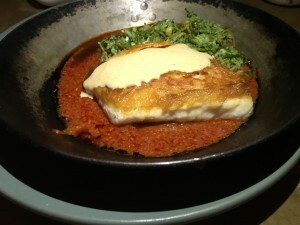 Its a generous portion of moist fish on a layer of spicy tomato sauce, topped with creamy tahini. (We ask Chef Shaya if he uses Soom Foods tahini, and indeed he does!) The dish is accompanied by basmati rice with herbs and walnuts. 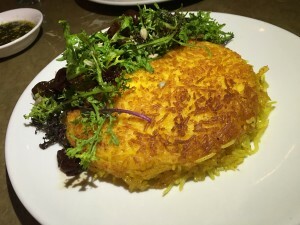 Persian rice with a crispy golden crust is enhanced by mustard greens and a jolt of unexpected seasonings. This dish is far spicier and complex than it initially appears. It’s one of the chef’s favorite dishes, and to taste it is to understand its charm. It’s Friday night, which seems like a perfect occasion for roast chicken. Shaya’s version incorporates black harissa, chickpeas, barley and root vegetables. I wish I could make roast chicken that has the power to elicit tears of joy. Chef Shaya is circulating throughout the restaurant, stopping to schmooze at every table. The Israeli born/Philadelphia bred chef engages in some Jewish geography with us, and we are smitten. The food here is outstanding; the experience elevated by the mensch of a chef and his enthusiastic staff. Herbsaint. Another name synonymous with New Orleans dining is Donald Link, owner of four top-ranked restaurants in the city. 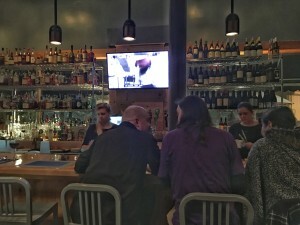 Herbsaint, a bistro with modern Southern/Cajun cuisine in the Warehouse District, appears on every list of best NoLo restaurants. Bill Addison of Eater includes it on his Essential 38 lists for 2016, as one of the “restaurants that shaped and defined American dining.” The 100-seat restaurant is casual, yet refined. 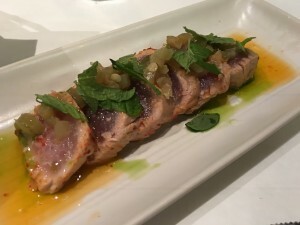 My husband and I share butter poached Gulf tuna with pickled chilies and mint, which shines with gorgeous ingredients and a pop of acidity and heat. 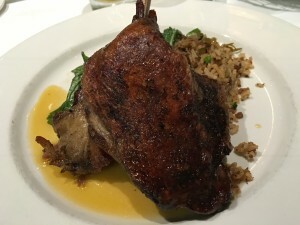 A signature dish at Herbsaint is Muscovy duck leg confit with dirty rice and citrus gastrique. The flawless execution exceeds my expectations. The meal here perfectly suits my desire to experience the illustrious flavors that are unique to this city. 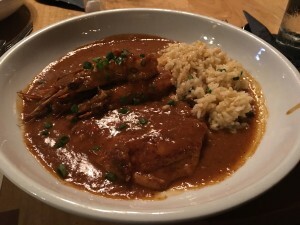 I have food envy as my friends enjoy a bowl of sinfully rich gumbo, which I neglect to order since our lunch included a stop at The Gumbo Shop in the French Quarter. In this case, two bowls of gumbo in a day would not be considered overkill, and I regret the omission. 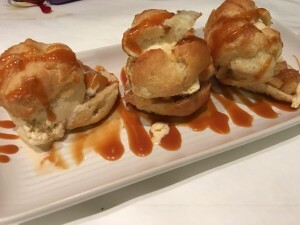 Apple pie profiteroles with brown sugar ice cream and calvados caramel console me in a most satisfying way. I intend to only highlight dinners in this post, but a quick word about Mother’s Restaurant. We initially choose to forego eating here- so many restaurants to explore and we don’t really want a heavy breakfast on top of other large meals. Numerous friends warn us that we are making a mistake by skipping the cafeteria-like restaurant founded in 1938. I learn from my no-gumbo mistake at Herbsaint, and cave to peer pressure. 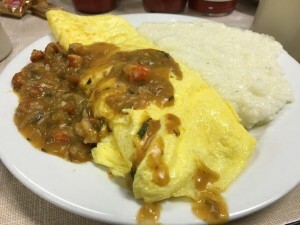 While the sign outside claims Mother’s has “the world’s best baked ham,” I opt for a hefty Crawfish Étouffée omelette served with a grits and a biscuit. I admit that Mother’s is a worthwhile experience, as a restaurant that showcases classic New Orleans cuisine. 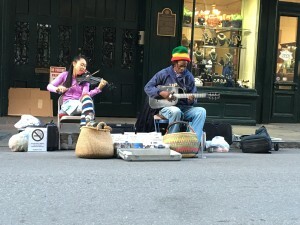 On a walking tour of the French Quarter our guides tells us about two musicians who perform on Royal Street. We stop by one afternoon and are absolutely mesmerized by the music. Sitting on a curb and listening to the rapturous sounds that Tanya and Dorise make with their violin and guitar is a highlight of the trip. I think of this passionate performance as a metaphor for the restaurants we explore in New Orleans. It’s a city where chefs utilize noteworthy ingredients to create a symphony of flavors. Their artistry deserves a standing ovation. Washington Post story on New Orleans by Tom Sietsema in his series “The Search for America’s Best Food Cities.” (He ranks New Orleans #4 out of 10).